With the benefits of Moore’s Law waning and the Internet of Things (IoT) targeting an untold number of lower end devices, embedded processor vendors are now tailoring solutions to the specific needs of end customers and applications more than ever before. The result? An emphasis on power efficiency, security, development tools, and cost. Forces at work in the electronics industry have reshaped the embedded processor landscape in recent years, among them, the slowing of Moore’s Law and the realization that most IoT devices will emphasize price and power rather than feeds and speeds. 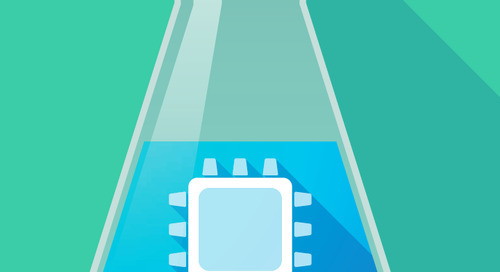 To be sure, embedded processors have traditionally been slow to adopt advanced process nodes, as longer lifecycles and the applications in question typically haven’t required top-of-the-line performance. However, with the cost of developing chips that push the limits of semiconductor lithography on the rise, Jag Bolaria, Principal Analyst for Embedded and Servers at The Linley Group, expects that power efficiency and consumption will continue to displace performance as the key driver of embedded and IoT processing solutions. “There is enough left in Moore’s Law to take us out to 2022, but the rate of new process technology will slow down and the costs for development will increase,” Bolaria says. “Specifically, the next nodes to come out are 10 nm in 2017, 7 nm around 2019, and 5 nm around 2022. The latter, however, is likely to need new fabrication technologies such as extreme ultraviolet (EUV) lithography, and at 5 nm, vendors may look at using exotic materials. Bolaria’s observations serve as a proof point for the continued success of the 8-bit microcontroller (MCU) market, where despite years of speculation to the contrary, vendors such as Microchip have seen sustained success in their PIC and (recently acquired) AVR product lines. But as opposed to innovations in the CPU itself, the endurance of these 8-bit technologies can largely be attributed to intelligent hardware blocks like core-independent peripherals (CIPs) that “allow designers to implement the most time-sensitive parts of their application in fixed-function, low-power, and always-on hardware,” says Greg Robinson, Senior Director of 8-bit MCU Marketing at Microchip Technology Inc. (Figure 1). “CIPs have the ability to communicate directly with other peripherals to create configurable hardware blocks,” says Robinson. “These “core-independent” blocks consume very little power and are much smaller than the RAM and Flash needed to implement the same function within the core. They also provide a quicker and more reliable response than a software-driven routine, which provides greater performance. CIPs require little to no code, eliminating the time and cost for validation and ultimately resulting in faster time to market. “This is a great alternative to the practice of utilizing the CPU’s sleep mode to lower power consumption when it’s not needed and then wake it up with a hardware interrupt in the event that it’s needed again, which brings in potential issues with variable startup time and interrupt latency,” Robinson adds. This is evident in perhaps the most significant enhancement of the Atom Processor E3900, Intel Time Coordinated Computing Technology (Intel TCC Technology), a switched fabric with global time awareness that connects internal digital signal processors (DSPs), image signal processors (ISPs), and sensor subsystems, and can be extended to time-sensitive peripheral devices via PCI Express (PCIe). “All about deterministic control loops or systems that require real-time computing down to the microsecond level,” technologies like TCC are an example of the chipmaker’s concerted effort to address application-specific needs in the key segments of automotive, industrial, and video (Figure 2). “With Intel’s approach from the edge to the cloud and the fog network in between, we have to think about it from a vertical solution first and work our way back to the technologies needed to solve the business problems that we’ve got,” Luse says. Like power efficiency, security is another aspect of embedded processing that is moving to the forefront of design requirements. While processor-based security has historically been seen as prohibitive due to the cost and development effort associated with implementation, “ARM’s introduction of TrustZone into Cortex-M-class processors over time is going to make the [security] hardware essentially not be a cost factor,” says Steve Hoffenberg, Director of the IoT and Embedded Technology Practice at VDC Research. “ARM TrustZone in particular has been around a long time, but its usage is growing considerably,” says Hoffenberg. “The hardware has been there, but in the majority of devices that have used those processors, [developers] haven’t actually used the security features of the hardware. “One of the focus areas for our next-generation Synergy Platform will be to further reduce complexity for developers creating secure connected devices with advanced security technologies,” says Haddad. “The use of ARM TrustZone for Cortex-M as a hardware virtualization capability will be integrated with the other elements of the Synergy Platform, including the security scheme, offering developers improved ease of use and leading to a higher adoption rate of TrustZone features in ARMv8-M-based systems. “Because of the rate of innovation coming with the IoT, development tools need to have the capacity to evolve quickly,” he adds. As always, development cost remains a consistent theme for consumers of embedded processing technology, but given the impending limitations of Moore’s Law, it has recently become more of an issue for suppliers as well. As processing solutions based on advanced geometries take longer to design and the photolithographic masks used to develop such wafers approach $5 million each at 16 nm fabrication nodes, programmable logic solutions have become more and more attractive to semiconductor suppliers. This is not only for the technological benefits they bring to the table, but also the cost synergies they provide, says Dan Mandell, Senior Analyst in the IoT and Embedded Technology Practice at VDC Research. As Mandell mentions, what semiconductor vendors are seeking to gain now and in the future from the integration of programmable logic blocks in their processor designs is the ability grow with changing interface standards and evolve over time to serve a broader range of customer requirements. However, while soft programmable logic IP does add dynamic characteristics as opposed to the traditional approach of completely hardwired chips, one drawback of the soft IP approach is its lack of density. In response, embedded FPGAs in the form of hard programmable logic blocks have gained traction as a way to meet the aforementioned challenges, enabling chipmakers to “reconfigure register-transfer level (RTL) blocks to allow certain critical portions of the chip to keep up with changes,” says Geoff Tate, CEO of Flex Logix Technologies, Inc. The core technology of Flex Logix is EFLX, an embeddable FPGA technology that can be configured in blocks as small as 100 look-up tables (LUTs) up to array sizes of 122,000 LUTs comprised of either straight logic blocks or a combination of logic and DSP blocks. The flexibility of this building block approach to embedding FPGA IP enables roughly 75 different array shapes and sizes, and to-date the technology has enabled on-chip functions such as bus acceleration or algorithm computation, programmable packet parsing, and configurable I/O in densities similar to that of Xilinx FPGAs. What sets the technology apart, though, is that it “can address everything from $1 MCUs to gigantic network switch chips with a digital architecture that we port to various process technologies,” Tate says (Figure 1). “We have a tremendous value proposition on the advanced nodes, and it’s very logical that embedded FPGA makes sense there,” Tate explains. “But on the other hand, it’s easier to get people over the hump to try something new on the older process nodes because they have more designs, they’re less expensive, and they can afford to take risks more easily. The most undeniable trend in the processor industry over the last 18 months has been the appetite for acquisition, which Bolaria attributes to the fact that “process technology is no longer bringing the same benefits in lower silicon and transistor costs” on the one hand, and “cheap money” on the other. The consequences of this rash of mergers are already being felt in the competitive landscapes for MCUs and SoCs, says Mandell, who cites Intel’s adoption of ARM-based FPGA SoCs and the possible accelerated sunsetting of NXP’s (now Qualcomm’s) Power Architecture portfolio as fallout of the activity. Nevertheless, he expects the pace to persist as emerging applications continue to unfold. 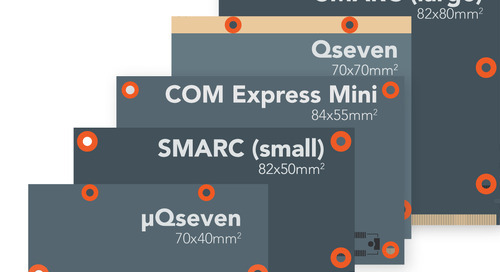 Credit card sized COMs: Which form factor to choose?